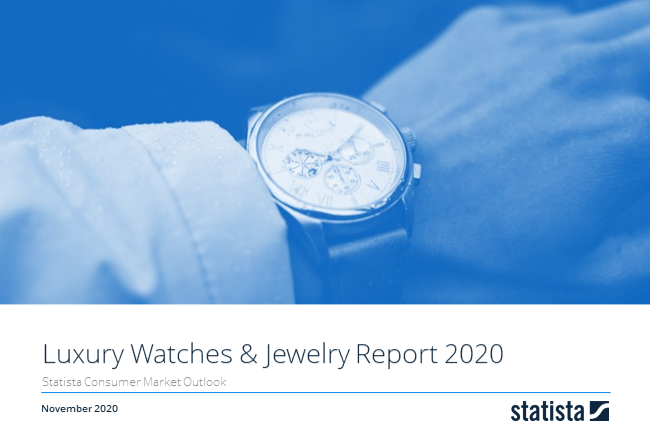 Revenue in the Luxury Watches & Jewelry segment amounts to US$21,485m in 2019. The market is expected to grow annually by 0.04% (CAGR 2019-2023). The market's largest segment is the segment Luxury Watches with a market volume of US$15,371m in 2019. In global comparison, most revenue is generated in China (US$29,226m in 2019). In relation to total population figures, per person revenues of US$28.40 are generated in 2019. Watches and Jewelry are usually referred to as “hard luxury” to differentiate them from fashion and accessories, which are made from comparatively “soft” materials. The overall definition of this segment follows broadly the Consumer Market Outlook’s Watches and Jewelry segment in the Accessories market, while here only sales of luxury brands are considered, and consequently, trend watches and fashion jewelry are excluded. Another difference is that luxury watches include hand-made watches that are not included in the Accessories market of the Consumer Market Outlook. The shown market data are based on an analysis of more than 100 of the biggest luxury companies in the world. A complete list of all companies and brands covered can be found in the methodology description. Accordingly, watches and jewelry from smaller companies or artisanal production unaffiliated with the companies covered are not included. All data are shown at retail value, which includes markups for retail distribution and sales taxes. The biggest players in this field are LVMH, Richemont, Kering, Swatch, Chow Tai Fook and Rolex. A detailed list of all assessed companies and their brands can be found in the methodology. Hard luxury is a mainstay of the personal luxury goods industry and still accounts for a high share of sales, yet it has been characterized by relatively low growth in recent years due to an economic slowdown and changing consumption habits especially in the Greater China region, which had fueled global sales in the beginning of the decade. Reading Support Revenue in the Luxury Watches & Jewelry segment amounts to US$21,485m in 2019. Reading Support The Luxury Watches & Jewelry segment is expected to show a revenue growth of -0.06% in 2020. Reading Support The average revenue per person in the market for Luxury Watches & Jewelry amounts to US$28.40 in 2019. Reading Support With a market volume of US$29,226m in 2019, most revenue is generated in China. Here you can find more studies and statistics about "Luxury Watches & Jewelry".